Once again, October upheld its reputation for market volatility and sharp reversals. After U.S. stocks climbed steadily over the last few months, early October surprised investors with the longest streak of daily declines since 2016. In the course of six days, the S&P 500® Index of U.S. large cap stocks gave back nearly all of its gains for 2018 amid growing concerns over trade and rising interest rates. High-flying technology stocks were among the biggest decliners, after having led the markets in recent months. However, while stocks plunged, the benefits of global diversification were all the more evident, with some of the most beaten down asset classes in 2018—like gold and emerging markets bonds—delivering positive returns. Other defensive asset classes such as Treasuries also rose, while cash provided its intended ballast amid the turbulence. With this recent bout of volatility, it’s important to remember that Schwab Intelligent Portfolios® is designed to provide broad diversification based on your financial goals and tolerance for risk. While still subject to market loss, automated rebalancing within Schwab Intelligent Portfolios accounts helps investors stay on track with their strategic asset allocation plan, including a "buy low-sell high" discipline as markets fluctuate. This can be challenging during periods of market stress, so an automated rebalancing process can help take emotion out of the decision-making process. While market pullbacks can be unsettling in the short-term, it’s important to remember that they typically occur at some point in most years, even though the S&P 500 has delivered a positive return for the full year most of the time. In fact, the S&P 500 saw market corrections of at least 10% in 12 of the last 20 years through the end of 2017, while ending with positive returns in all but four of those years. These types of pullbacks within an extended bull market are considered healthy and are expected to occur from time to time. Since its inception in March 2015, Schwab Intelligent Portfolios has successfully navigated market corrections in mid-2015, early 2016 and early 2018—helping investors maintain their targeted asset allocation through disciplined rebalancing while delivering competitive longer-term returns. These types of big short-term market movements, both to the downside and the upside, often leave investors confused about the performance of their own investment portfolios. During these periods, it’s important to take a step back and remember some important investing principles, including the benefits of diversification and staying focused on your longer-term plan. Markets are volatile by nature and are expected to encounter bouts of volatility from time to time. Investing in a diversified portfolio consistent with your objective and risk profile is designed to help you reach your longer-term goals while smoothing the ride along the way. Diversified portfolios include various investments for specific purposes. Stocks provide potential growth but come with higher volatility. Bonds can provide income as well as diversification to help moderate volatility. While interest rates might move higher, bonds still serve these important purposes in a diversified portfolio. Cash and cash equivalents can provide a stabilizing foundation and ballast during periods of turbulence. Various types of investments move in and out of favor over time. Just because one asset class is doing well or poorly at any given time doesn't mean you should include or exclude that asset class from your portfolio. Trying to time markets and chase short-term performance is one of the biggest mistakes that investors often make. A diversified portfolio might outperform or underperform the S&P 500 on any given day or week. But one week's returns are not a long-term investment plan. Ignoring the short-term noise and staying focused on your longer-term goals are among the keys to long-term investment success. During 2017, stocks delivered strong returns while core bonds such as Treasuries were relatively weak. By contrast, during the market correction at the beginning of 2016, stocks did poorly while defensive asset classes such as Treasuries and gold did well. This underscores how performance across asset classes can vary significantly in the short term. 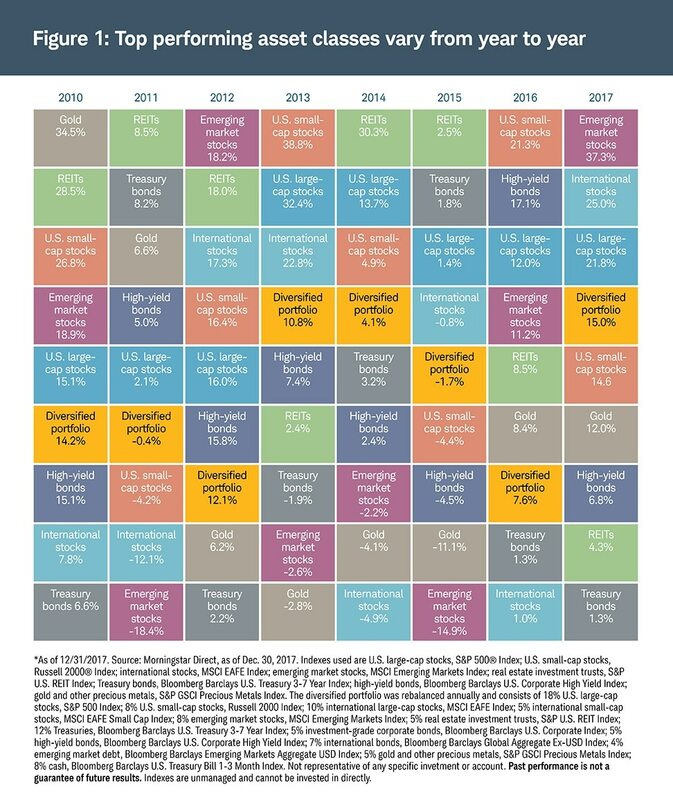 Top- and bottom-performing asset classes have tended to shift from month to month and year to year with no discernable pattern. By diversifying across geographies and asset classes, you can help increase your chances of being invested in whichever asset class is leading at any given time, while not suffering the effect of only owning the weakest performers. Among the asset classes shown in Figure 1, emerging market stocks and international developed market stocks were the strongest performers during 2017 after having been the bottom performers in 2015 and 2016 respectively. Similarly, real estate investment trusts (REITs) and Treasuries were among the top performers in 2015 but among the bottom in 2017. By contrast, a hypothetical portfolio diversified across stocks, bonds, commodities and cash (shown in yellow) avoided the peaks and valleys of each of the individual asset classes in Figure 1 and delivered smoother performance over the time period shown. This is the value of diversification: it can help dampen volatility over time, even if it doesn’t guarantee a profit or, in a falling market, protect against losses. 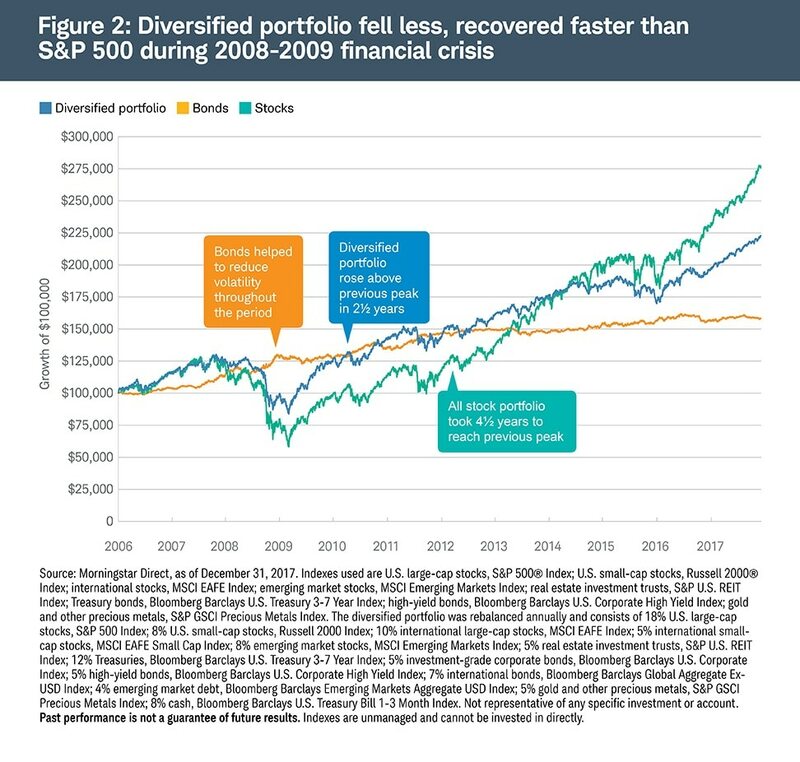 To understand the potential benefits of diversification on longer-term portfolio returns, look at the period surrounding the financial crisis of 2008–2009. As Figure 2 shows, the hypothetical diversified portfolio from Figure 1 would have fallen less than the all-stock portfolio, and would have recovered to its previous peak in about half the time. And while the all-stock portfolio had a higher ending value, investors would have had to stay invested throughout the entire period to earn that return, riding out the more precipitous decline and then the slower climb back up. Investors who succumbed to the panic that typically accompanies turbulence and exited the markets after the declines of 2008 might have missed out on part, or potentially all, of the subsequent market rally. Diversification can help investors avoid this risk by moderating portfolio volatility to help them navigate through this turbulence while sticking with their plan. When markets experience big moves downward or upward it can sometimes be challenging to stay focused on your longer-term strategic asset allocation plan. Overreacting to short-term market movement by panicking in the face of volatility or trying to time markets and chase short-term performance is one of the biggest mistakes that investors often make. Instead, having clearly defined longer-term goals and maintaining a commitment to your plan can be key to long-term investment success.